Front and back view; Charm measures 1/2" x 1/2". Dogs and love...you can't have one without the other. This dainty charm features a dog silhouette on one side and the word "Love" (paw print) on the other. 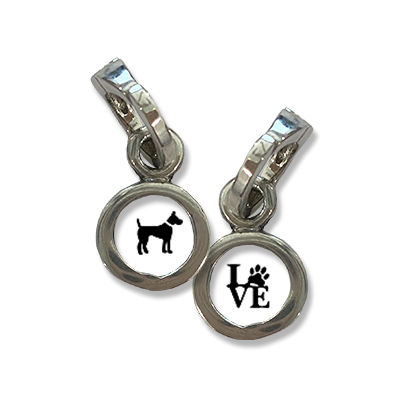 Wear alone and close to your heart, or pair with our "Four-Legged" charm and your pup's Initial for a fitting tribute to that furry face that always makes you smile.